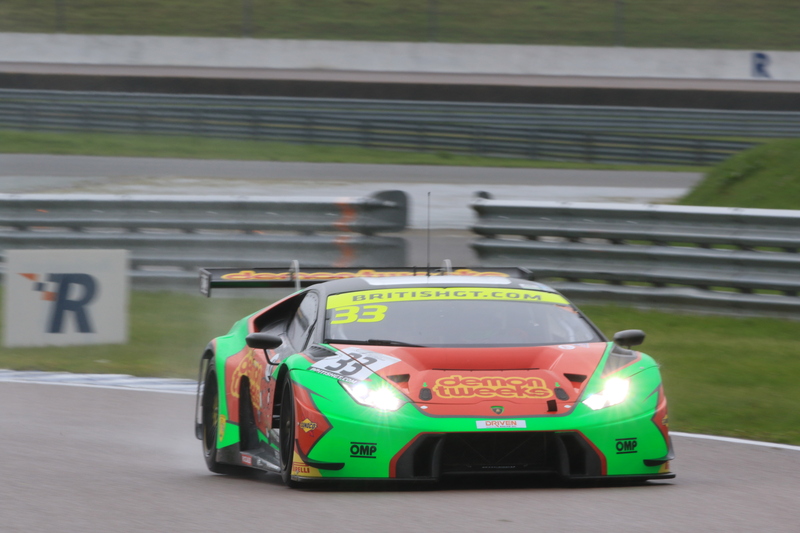 Jon Minshaw and Phil Keen put the #33 Barwell Motorsport Lamborghini Huracán GT3 on pole for Sunday April 29’s Round Three of the 2018 British GT Championship at Rockingham Motor Speedway after Minshaw and Keen lapped the Corby circuit in an aggregate time of 3:03.063. 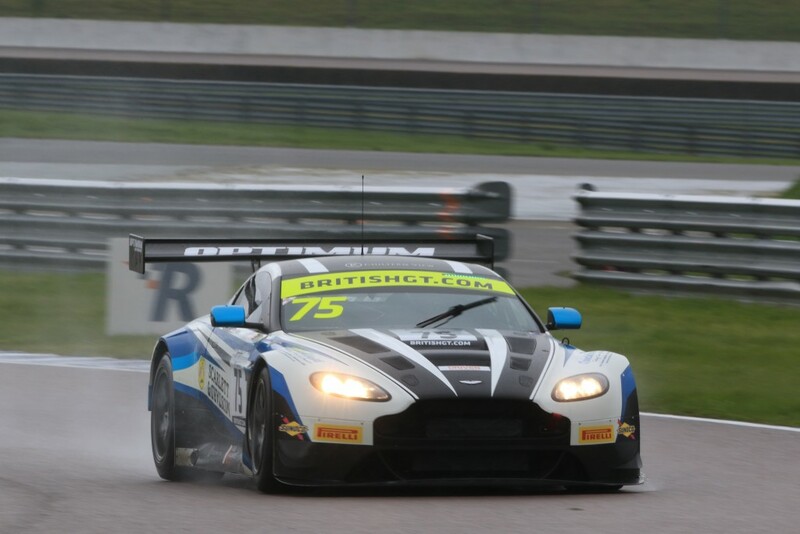 Second on the grid will be the #75 Optimum Motorsport Aston Martin V12 Vantage driven by Flick Haigh and Jonny Adam with an aggregate time of 3:03.755. Aston Martin took two of three top positions in qualifying after Mark Farmer and Nicki Thiim went third quickest with an aggregate time of 3:05.755 in the #11 TF Sport Aston Martin V12 Vantage. 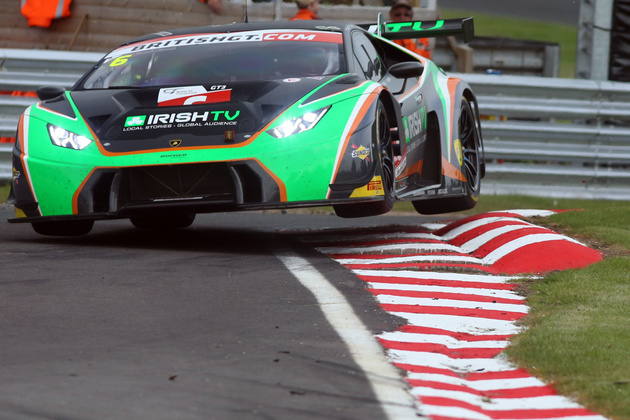 Qualifying got underway in wet but drying conditions and it was Flick Haigh in the #75 Optimum Motorsport who set the early pace with a 1:32.844 set in the closing seconds of the ten-minute session, nearly a full second quicker than Jon Minshaw in the #33 Barwell Motorsport Lamborghini. The session saw Lee Mowle in the #116 ERC Sport Mercedes-AMG GT3, spin and make contact early in the ten-minute period and unable to set a time. Yelmer Buurman got the#116 entry out in the GT3 Pro session but the #116 will start from the back of the class grid as a result of not setting a time in the Am session. 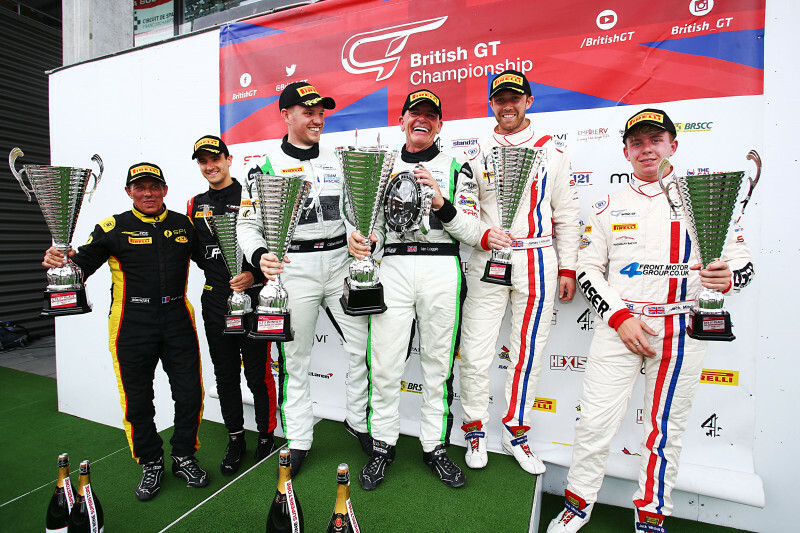 With Jonny Adam taking over the #75 entry for the GT3 Pro session, it seemed inevitable that the Wakefield-based team would be enjoying its third pole position of the season. Phil Keen, now behind the wheel of the #33 Barwell entry, had other ideas and put in a 1:29.235, nearly 1.7 seconds quicker than Adam’s best of 1:30.911. Jon Minshaw made the best use of limited running to put in a quick lap in the Am session. Jon Minshaw, however, sees the two-hour race on April 29 as a chance to get some good points but is not hopeful of a victory given the success penalty from Round Two. “If it’s wet, we may have a chance (of the win). I think, if it’s dry, we will be lucky to be in the top six,” said Minshaw. 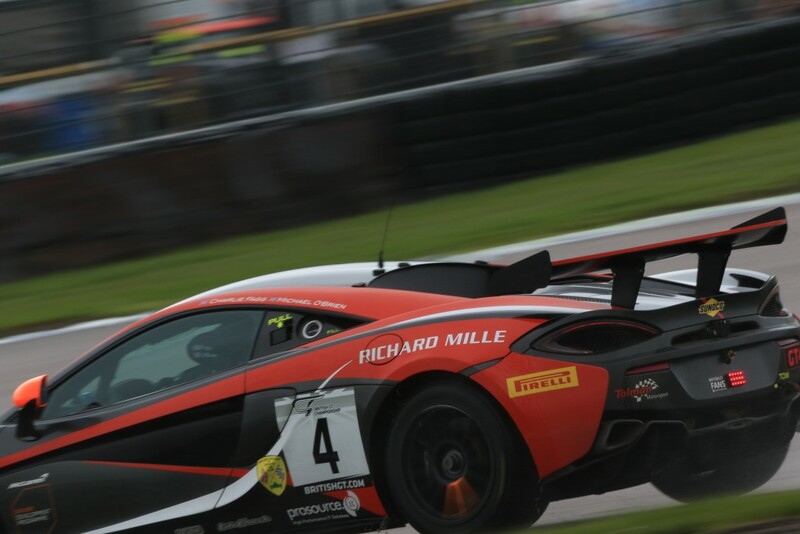 The GT4 class was dominated by the Tolman Motorsport Ltd entries with the #4 and #5 McLaren 570S GT4s topping the time-sheets in the Am session with a 1:35.584 set by Charlie Fagg in the #4 car and a 1:36.98 put in by Lewis Proctor in the #5 entry. Third quickest in the first GT4 qualifying session was the #42 Century Motorsport BMW M4 GT4 piloted by Ben Green. Michael O’Brien in the #4 entry and Jordan Albert in the #5 car locked out the front row of the class grid with a 1:35.645 and 1:35.815 respectively to put the #4 entry on class pole with a 3:10.645. The session did not go all the way of Tolman Motorsport Ltd, however, after David Pattison, behind the wheel of the #56 entry, spun on the entry to Gracelands, briefly causing the Am session to be red-flagged with 07:34 to go. Charlie Fagg was delighted to get pole for Sunday’s two-hour race. 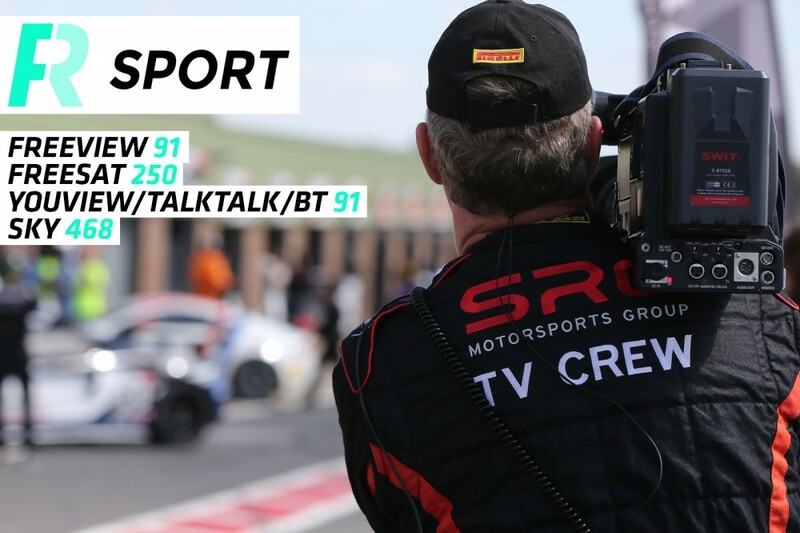 The lights go out for Round Three of the 2018 British GT Championship at 13:10 on Sunday April 29.